I took a break from my furniture project and made a these tea boxes. The woods are birch, walnut and lacewood; and birch and sycamore. Thanks for looking. I like the one on the left. The color of the lacewood lid threw me off for a minute. Initially, I thought it might be paduak. I also thought the birch was cherry at first. The contrast between the walnut, lacewood and birch is striking. Plus the birch plugs make a nice contrast on the sides. The lid looks like it curves ever slightly as well. I’m also going to shamelessly “borrow” the lid handle. How is the lid attached to the box? Judging by the plug, it might be a rod through the sides? Good looking boxes, I am a big Tea drinker but only loose leaf. EarlS, the dowels are not birch, but rather bamboo, corn dog sticks to be precise. The “hinge” is just 2 brass pins inserted through the sides into the lid. Here is a close up. I love how simple these appear to be, almost effortless…as if you walked into your shop one day and there they were, ready to be used. 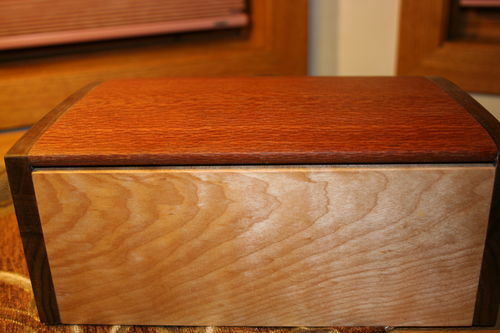 The dowel and glue joint looks great and so neat (meaning, tidy…not like, groovy) I am certainly inspired by these as a novice box maker, this might design seems to be less daunting than cutting dovetails. Those are very pleasing boxes. I’m partial to sycamore so I’ll say the one on the right for me, but the other is also very nice. But I’m a loose-leaf guy too, and just made a pot a few minutes ago. I suppose one could make a box for loose tea too, but I just keep it in the bag it came in. Beautiful from the wood through all the details. 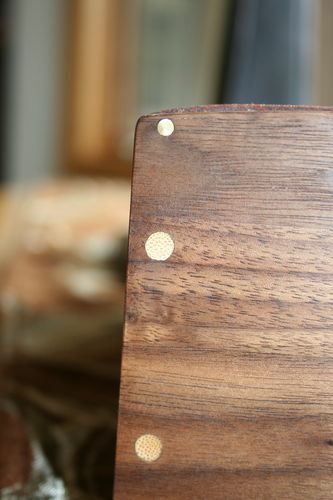 Love the brass pin hinge, Always have liked the look of a dowel/pinned corner more than a DT. Plus you filled the interior with something besides space. Nice boxage, thanks for posting, and Congrats on your 3. These are really nice! I do love the simplicity like the comments above. 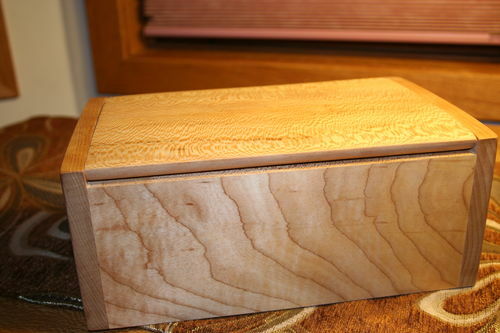 I have made boxes in this style and am curious, could you post a picture of the back side, how you did the back side to interact with the lid? Very nice work and congratulations on your Top 3. Kim, the underside of the lid on the back side is radiused, so that it has clearance to open. I used 5/16” radius router bit. You also have to elevate the lid off the back just a sliver, less than 1/16” to get the clearance for it to swing. Tea boxes will never be the same. Nice work. Beautiful pieces, very nice boxes. Really like the explanation of the build, thanks. Love the boxes.